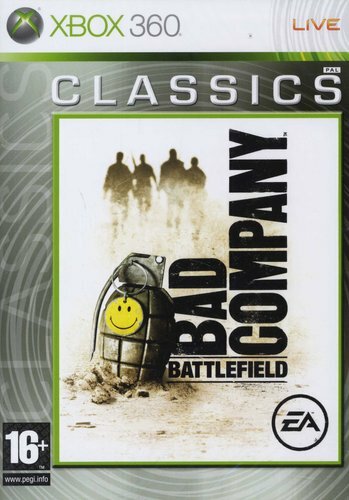 Cinematic single-player experience - A deep campaign loaded with attitude follows a wayward band of ordinary soldiers who risk it all on a quest for personal gain.War, your way - Battlefield: Bad Company environments are 90 percent destructible, meaning that any structure can be demolished down to its foundation. 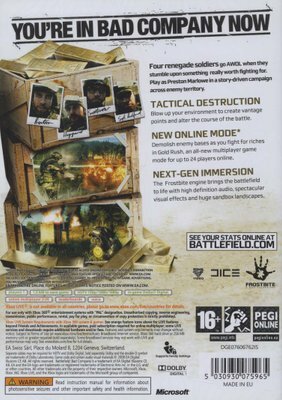 Gamers can shape the battlefield to match their play style - the possibilities are literally endless.New vehicles, weapons and toys - Land, air or sea, dozens of new tools are waiting for explosive experimentation. Battlefield: Bad Company gives gamers the building blocks to get creative and usher in a new era of their own "Battlefield moments"Frostbite game engine - DICE's Frostbite game engine raises the bar for next-gen gaming, with stunning HD graphics that bring characters, vehicles, and environments to life like never beforeGenre-defining multiplayer - Support for 24 players online* in a world designed to take full advantage of the game's massively destructible environmentsTrue "Through the gun" experience - DICE's attention to detail is applied to the act of firing a weapon. Dozens of subtle changes to the FPS formula add up to a vastly improved shooting experience.